Illinois Department of Public Health officials on Wednesday reported nine probable cases of swine flu in the state and are expecting more. Federal and state officials are making efforts to prepare for the possibility of the virus spreading in Illinois and the rest of the nation. The U.S. Centers for Disease Control and Prevention last reported 91 confirmed cases in 10 states and one death in Texas. The outbreak of swine flu in multiple areas across the country prompted the federal government to declare a public health emergency. The declaration is an administrative move to kick state and local governments' individual treatment and prevention plans into motion. Gov. Pat Quinn made a move similar to the federal declaration with a gubernatorial proclamation that allows him to access state resources to address any needs that may arise. U.S. Health and Homeland Security officials released stockpiled medical supplies and anti-viral drugs, Tamiflu and Relenza, to the states, and the Illinois Department of Public Health expects the state to receive a shipment this week. The Illinois State Board of Education has posted information and recommendations regarding swine flu and school closings on its Web site. In an 11th-hour move, Gov. Pat Quinn sent a letter requesting an extension in the decision to close the William A. Howe Developmental Center in Tinley Park, a Chicago suburb. The letter was sent to members of the legislative Commission on Government Forecasting and Accountability, requesting a minimum 30-day extension to complete his own assessment of the facility. Howe, which houses developmentally disabled adults, has had its share of problems in the past three years. It was decertified almost two years ago by the federal government for failing to meet minimum standards of care, forcing the state to pick up the check for the center’s operating costs. Prior to today’s vote, committee members expressed dismay concerning the governor’s actions. With 12 members present, the vote was deadlocked 6 to 6, but with a quorum of seven votes needed to deny the governor’s request, the motion died and Howe is now recommended for closure. However, the State Facilities Closure Act makes a closure by the commission only advisory to the governor. Similarly, the committee members also voted to close Tinley Mental Health Center. Both facilities occupy the same parcel of land. Members voted 9 to 3 in favor of closure. Advocates who wanted the center closed cite at least 30 deaths that have occurred on the grounds in the past 2 ½ years, one as recent as last month. Tom Green, spokesman for the Illinois Department of Human Services, said he is pleased with the decision made today by the commission. Advocates who want the center to stay open tell a much different story. Belinda Baker, director of the Mechanical and Transportation Department at Howe Developmental Center, said she thinks members made a terrible mistake. “First they need to review all of the facts and look at the data that we’ve provided that shows we give quality care to all of the patients and residents of Howe,” she said. As for any alleged incidents of mistreatment and the number of deaths reported in the past three years, Baker said, those can happen anywhere. The commission’s recommendations are filed May 9, 2009, at which time Quinn will either accept the vote or proceed with an independent inquiry into Howe before issuing a decision. Quinn is sticking to his back-up plan of tackling ethics issues at the ballot box if the legislature does not approve substantial reforms by the end of this session. However, the state Constitution limits the issues voters can petition to get on the ballot. Despite Quinn’s generally optimistic and cooperative tone, Quinn essentially said if the legislature fails to make major changes in the way state government operates, he would look to the voters to do it for them. Quinn backs other changes that were not recommended in the report, including recall of elected officials and extending public financing beyond judicial races to the other branches of government. He said that he hopes to get a recall amendment on the ballot in 2010. UPDATED: Lawmakers are considering several recall amendments. Some would grant voters the power to recall executive officers only, and some would apply to the legislative and judicial branches, as well. Commissioners said they could not reach a unanimous decision on whether to recommend a recall amendment, so the report lists “recall” as needing further consideration. Gov. 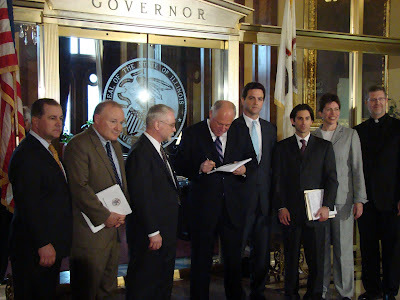 Pat Quinn’s Illinois Reform Commission issued its final recommendations for reforming Illinois government, passing the torch to the state legislators to act before their scheduled May 31 adjournment. While some reform measures appear slated for widespread agreement and enactment, other provisions are more controversial and expected to take a lot more time to negotiate. Commission chairman Patrick Collins, a former assistant U.S. attorney, said for legislators or opponents who say the commission’s recommendations equal “pie-in-the-sky” ideas, every proposal has been tried in other states or jurisdictions. “It is no excuse to say that these can’t be done because they have been done,” he said. A few of the recommendations are new concepts for this legislature to consider, meaning lawmakers will have to build to a new comfort level before acting, said David Morrison, deputy director of the Illinois Campaign for Political Reform in Chicago. That comfort level might not come until proposals are spelled out in new legislation. “It’s not enough to describe the cake. You have to give the recipe, too,” he said. Even for the controversial proposals, Morrison said he’s encouraged by the commission’s thorough report (the appendices alone take up 152 pages), which resulted from active engagement from people throughout the state. The commission’s effort also couples with the legislature’s special joint government reform committee. “There’s real intentional, deliberate action that may come out of this,” Morrison said. Something new for legislators to consider is the commission’s concern that state law hamstrings state-level investigators. In turn, Illinois tends to rely on federal prosecutors to go after such public corruption cases as former Gov. George Ryan, political insider Tony Rezko and, now, former Gov. Rod Blagojevich, among many others. According to the report, prosecutors in most other states have powers and resources similar to those of federal investigators. Not Illinois. The commission said this state is only one of four that prevents states investigators from recording conversations with consent of one of the parties. Also, the Illinois attorney general can convene a statewide grand jury to investigate some crimes but not cases of public corruption. That contrasts with Pennsylvania and most other states, according to the report. Morrison said the idea of strengthening the powers of state prosecutors was one of the “most inspiring” recommendations. “We plainly cannot rely on federal law enforcement to police Illinois politics,” he said. “We need something that’s going to move faster than that.” It took prosecutors more than seven years to prosecute and convict Ryan. “Just because the Collins commission says jump, it’s not our responsibility to say, ‘How high?’” he said. Limiting the length of time state legislative leaders can serve in the top positions, for instance, hasn’t been debated. And it’s unlikely to find traction any time soon. The amount of the cap is at least one sticking point. “We may be voting for two or three different caps,” Garrett added. On the other hand, procurement, or the way the state contracts with service providers, is one area where widespread agreement could expedite reforms. But legislators are unlikely to go as far as recommended by the Illinois Reform Commission, which suggests pulling out all chief procurement officers and putting them into a new, independent state agency. Procurement officers expressed concerns last week about whether new rules would slow down an already cumbersome process. While Illinois has no confirmed cases of swine flu yet, health officials said today the virus eventually will reach the state and that they are prepared for it. Dr. Damon Arnold, director of the Illinois Department of Public Health, said in a Statehouse press conference, “We fully expect to see confirmed cases within Illinois state at some point and time.” The U.S. Centers for Disease Control and Prevention last reported 40 confirmed cases in the nation. Seven people who got tested in Illinois this past weekend were cleared. According to the U.S. Department of Agriculture, no pigs in the United States have tested positive for the virus. Illinois already has an emergency plan for serious communicable diseases. Arnold said the department created a virus pandemic plan a few years ago when bird flu became a threat. “People are actually in place already and know what their jobs are,” he said. Arnold added that his agency is constantly monitoring the situation. The symptoms of swine flu resemble the common flu but typically are more intense. They can include fever, chills, sore throat, body aches, headache, fatigue and lower back pain. Nausea, vomiting and diarrhea are less common symptoms. Andrew Velasquez III, director of the Illinois Emergency Management Agency, said anyone who has debilitating symptoms, including difficulty breathing and severe vomiting, should go to a family physician or hospital for testing. He also said that people whose symptoms start to improve and then take a turn for the worse should seek medical attention. The elderly, children younger than 18, and individuals with respiratory illnesses or weakened immune systems are especially at risk. Arnold said that there are two types of standard seasonal flu viruses going around, so people who get sick should not immediately assume it is swine flu. He said that if people have mild flu symptoms, they should treat them the way they would normally treat flu at home and only go to the doctor if that doesn’t work. Velasquez added that anyone who feels sick after recently traveling to an area with confirmed cases of swine flu should seek medical attention. The incubation period for the flu averages three to five days. If travelers do not get sick after seven days, they shouldn’t worry about being infected. Both Arnold and Velasquez said that their agencies are taking the threat seriously and coordinating their efforts with the Centers for Disease Control and Prevention, as well as state agencies and local health departments. Updated information about swine flu and tips to stay healthy can be found at the Centers for Disease Control and Prevention, the Illinois Department of Public Health and the Illinois Emergency Management Agency. After facing uncertain futures and becoming pawns in a game of political revenge, the state’s closed historic sites reopened today. The 11 historic sites were closed last year, along with several state parks, by former Gov. Rod Blagojevich in a move that many said was politically motivated. Gov. Pat Quinn would not say that Blagojevich closed the sites out of retribution for lawmakers, but he did say that his predecessor’s decision was not a “rational” one. The money to reopen the sights was included in the mini-capital plan that passed early this month. Jan Grimes, director of the Illinois Historic Preservation Agency, said that even in difficult financial times for the state, it’s important to preserve history. “It’s times like this when we face historic challenges that we most want to look back on how others managed change before us, how others endured and even thrived,” she said. Quinn signed an executive order to merge the Historic Preservation Agency with the Illinois Department of Natural Resources in what he described as an effort to streamline government and save money. The agencies will officially combine July 1. Quinn said the state’s historic sites draw tourism and help to bring money to local economies. “When people go to visit another city or another place, they want to see unique things that are special that make a difference. And the Dana-Thomas House is one of those, and the other historic sites are, too,” he said. Although the money needed to keep the historic sites open was not specifically included in Quinn’s budget proposal, he said that the sites will remain open through the next fiscal year. Gov. Pat Quinn commemorated Earth Day by signing an executive order to make state agencies more “green,” while several measures addressing environmental issues are under consideration in the legislature. Quinn signed the executive order after announcing that several light bulbs in the Executive Mansion will be replaced with more efficient LED bulbs, and rain barrels will be placed around the building to catch water for gardening. The LED bulbs, which were donated by a company called The LED Way based in Skokie, are expected to save more than $4,500 a year. Cut solid waste production 40 percent by 2015. Reduce paper consumption 20 percent by 2012. Decrease electricity and natural gas usage 25 percent by 2025. Lessen petroleum consumption 20 percent by 2012. And after 2025, 60 percent of the new vehicles purchased by the state would have to be hybrid gas and electric vehicles, and 15 percent would have to solely run on electricity. According to Sarah Wochos, a policy advocate for the Environmental Law and Policy Center in Chicago, the order puts Illinois on par with environmental goals set in many Midwestern states. A bill that advanced to the Senate sponsored by Rep. Karen May, a Highland Park Democrat, would require state-owned buildings to be cleaned with only environmentally friendly products. Another measure that passed the House would potentially make environmentally friendly products or services more competitive in the bidding process for state contracts. Agencies could consider a “green” product or service that costs up to 10 percent more than a regular product or service under this proposal by Rep. Michael Tryon, a Republican from Crystal Lake. Perhaps the most controversial bill would create a so-called cap-and-trade program for Illinois. Companies that vent large amounts of carbon emissions would have to buy carbon credits from the state to offset their pollution. A certain amount of credits would be auctioned off to create revenue for the state. A cap-and-trade program for carbon is being considered in the U.S. House, as well (summary here). In Illinois, Sen. Heather Steans, a Chicago Democrat, is sponsoring the Senate version of a state cap-and-trade program. She said that she doesn’t think it’s time for the state to pass its own program. However, she said she hopes the bill will help to pressure Congress to take action on a nationwide program. House sponsor Rep. Elaine Nekritz, a Democrat from Northbrook, agrees. But she said that if legislators approach a statewide cap-and-trade policy as a potential revenue source, it might be realistic to consider it during the current budget crisis. A transportation and business group is proposing what it says is a more specific plan than Gov. Pat Quinn’s proposal for major construction plans for roads, bridges and transit. Sen. Martin Sandoval, a Cicero Democrat and chairman of the Senate Transportation Committee, came out in support of the Transportation for Illinois Coalition’s proposed capital plan today. The coalition claims the plan calls for more state money than Gov. Pat Quinn’s proposal for a capital plan, but almost $10 billion less than the coalition says the state should be investing in its infrastructure. According to a 2006 study commissioned by the Transportation for Illinois Coalition, the unfunded need for Illinois transportation projects exceeds $23 billion. That number has not been adjusted for inflation. Linda Wheeler, a transportation consultant for the Transportation for Illinois Coalition, said the findings mirror the Illinois Department of Transportation’s estimates of the unmet needs. Wheeler said that Quinn’s proposed budget is not specific enough about how much state money would go toward transportation and that it uses some creative accounting techniques. She said that some of the money that is listed as highway funding actually would go toward debt service on bonds. Sandoval said he wants to fund the alternative plan with a motor-fuel tax increase, which he said has support in the Senate. However, he said he supports a higher increase than a version proposed in the House, which seeks an 8 cents per gallon increase. Sandoval said that he thinks there is little to no support for Quinn’s proposal to spend part of the money from an income tax increase to fund a capital plan. While Sandoval had the backing of business groups, labor unions, transit officials and transportation experts, he was the only legislator making a pitch for the coalition’s proposal. Many of the speakers who addressed the Senate committee this morning raised concerns that too much squabbling in Illinois over a capital plan could hurt the state’s image in Washington, D.C. and possibly damage its ability to seek increased federal funding in the future. State employees who want to decide which doctor they see or what hospital they are admitted to may have to re-think their health care options. According to the legislative Commission on Government Forecasting and Accountability, state employees collectively would be on the hook for $200 million more for their health insurance plans. The commission met with medical providers today to determine whether existing contracts should be renewed for next fiscal year, which starts July 1. Gov. Pat Quinn’s administration is seeking a health insurance policy that would charge state employees more in monthly premiums if they chose more flexible plans, as opposed to a managed care policy. For example, employees enrolled in the most flexible plans currently pay about $90 a month. Under the administration’s proposal, that premium would increase to nearly $310. Retirees also would pay more, under Quinn’s proposed operating budget. If approved by the General Assembly, retirees who are not enrolled in Medicare would see the biggest increase. They currently pay about $13 a month for state health benefits. That would increase to about $583 a month. The increase in premiums is, in part, an effort to encourage employees to sign up for less expensive managed care plans. The flexible plans allow patients to see any doctor they prefer, while managed care plans limit patients to see doctors on a pre-approved list. Collectively, the projection for Illinois’ State Employees’ Group Health Insurance Liability tops out at $2.1 billion for the next fiscal year, compared with $1.9 billion last year, according to the Commission on Government Forecasting and Accountability. Dr. Quentin Young withdrew himself today from consideration as the new chair of the Illinois Health Facilities Planning Board because of a possible conflict of interest. Last Friday, Gov. Pat Quinn named Young, a health care advocate who previously served as Quinn’s physician, to head the board. According to a statement from Quinn, Young withdrew his name when he realized that his former practice owns part of a property that rents space to a health care provider. Young still has a stake in the practice, and Illinois law bars the head of the hospital planning board from having financial ties to any institution licensed under the state’s hospital licensing act. That cliché of the day indicates the number of days state legislators have to negotiate major spending and revenue proposals before they’re scheduled to adjourn their spring session May 31. With ethics reforms, health care negotiations and construction projects in the mix today, alone, lawmakers have a ton of work to do in the next five and a half weeks. Today marked the first time that Gov. Pat Quinn’s Illinois Reform Commission directly interacted with the joint legislative committee on government reform, both of which are working separately on some of the very same topics. Today, however, the commission was asked to narrow its testimony to state procurement and contracting practices. The focus conveniently skipped over one of the commission’s most controversial proposals: limiting campaign contributions. So-called contribution limits topped the commission’s first set of recommendations late last month. It’s hard to avoid the link between campaign contributions and state procurement decisions, said Commissioner David Hoffman, inspector general for the City of Chicago, particularly when repeated investigations reveal that public funds flow through contracts to the same companies that shovel large amounts of money into candidates' political campaigns. “You’ve got to get to both sides of the equation, the pay side and the play side,” he said. But the commission abided by the committee’s request and focused on ideas for state procurement reforms. The commission’s recommendations are intended to improve transparency and insulate the process from political influence, preventing such alleged scandals as requiring state contractors to go through political fundraiser Bill Cellini. Commissioner Patrick Collins, a former assistant U.S. attorney, said Cellini was not a state employee, but prosecutors allege that he exercised significant influence over which firms received state business. The Illinois Reform Commission suggests creating a new department to house all state procurement officers, making them independent from the state agencies and from the governor’s office. A new procurement monitor also would oversee and review contracts. The state already has a Procurement Policy Board to oversee contracts; yet, Hoffman said because members are appointed by the governor and the legislative leaders, they’re powerless to resist political pressure. Hoffman said the goal is not to change the procurement rules but to change whom the procurement officials report to. Legislators and some state officials aren’t fully on board with the commission’s idea to consolidate procurement officers into a new department because needs are so different when hiring companies for road construction, power supply or higher education material. The commission plans to release its second set of recommendations next week, marking 100 days since the panel started holding public hearings throughout the state. Senate President John Cullerton said the committee will consider all of the commission’s recommendations, but he also intends to speak with Quinn to find out what he wants to pursue. House Speaker Michael Madigan indicated the legislative committee and the governor’s commission would work closely together to draft legislation. While human service providers have long fought for more state funding, mental health and substance abuse providers who offer services at the community level say they need as much as $93 million to prevent thousands of people from losing access to critical services next year. Frank Anselmo, chief executive officer of the Springfield-based Community Behavioral Healthcare Association of Illinois, said Gov. Pat Quinn’s budget proposes $26 million less than last year for mental health services and $12 million less for substance abuse services. The cuts have a cumulative effect, Anselmo added, because the state reimbursement rate for Medicaid providers doesn’t cover half of the cost of providing the services to needy clients. The association surveyed providers throughout the state to ask what would happen if the legislature approved the cuts this spring. Providers reported that more than 16,000 Illinois residents could lose access to treatment in their communities by July 2010. And the nearly 30,000 people who do have access to treatment could receive reduced services. Diane Knaebe, president of Heritage Behavioral Health Center in Decatur, said at a Statehouse news conference this morning that the agency could serve 400 fewer clients in Macon County next fiscal year and decrease services by at least 10 percent for existing clients if more funding didn’t come through. Lora Thomas, executive director of the Illinois chapter of the National Alliance on Mental Illness, said saving money by not funding mental health services often causes untreated conditions to eventually demand costlier care in emergency rooms, prisons and nursing homes. The Community Behavioral Healthcare Association of Illinois’ goal is to access existing state funds, increased federal reimbursement funding and new state revenues to help pay for mental health services, substance abuse services, backlogged Medicaid bills and health care for Illinois veterans. According to the association, about $35 million sat dormant in dedicated state funds during the last few years of former Gov. Rod Blagojevich’s administration and continues to be unused. The Illinois Department of Human Services had not responded to questions by the time of this post. At least 10 senators of both political parties have signed on to a resolution, SJR 31, urging Quinn’s administration to tap into the unused state funds, as well as increased federal Medicaid reimbursements available through the federal stimulus package, to support mental health and substance abuse services. But the resolution is not binding. If new revenue came into Illinois through a state income tax increase, community providers want part of it dedicated to human services. Anselmo said the group also supports the concept of increasing the sales tax on alcohol by 1 cent or 2 cents per alcoholic drink. Watch for more on funding of mental health and other human services soon. Gov. Pat Quinn announced today his pick to run the state health planning board that has been recently plagued by scandal. At a Chicago news conference, Quinn named Dr. Quentin Young, his one-time personal physician and an advocate for health care reform, to chair the Illinois Health Facilities Planning Board. Young has served as chairman of the Department of Medicine at Cook County Hospital and president of the American Public Health Association. He is currently the national coordinator for the universal health care advocacy group, Physicians for a National Health Program. The board approves major construction projects and equipment purchases for health care facilities in Illinois. They could include such improvements as “who gets to have an MRI machine and who gets to build a new wing,” according to Chris Mooney, political studies professor with the Institute of Government and Public Affairs at the University of Illinois at Springfield. That apparently was the attraction that drew former board member Stuart Levine, and former Gov. Rod Blagojevich fundraiser, Tony Rezko to seek control of the board. The two used their influence over the body, which also considers proposals for new hospitals in Illinois, to pressure interested parties for kickbacks. Levine, a former board member, has pleaded guilty to corruption charges, and Rezko, a friend and adviser of former Gov. Rod Blagojevich, has been convicted on corruption regarding their dealings with the board. Mooney said that past corruption on the board does not mean that there will continue to be problems under new leadership. Anti-tax protesters gathered in front of the Illinois Capitol today, shouting the message that they are Taxed Enough Already (TEA) on the last day people can file their income taxes without an extension. Meanwhile, Gov. Pat Quinn launched a new Web site intended to help taxpayers and government employees report corruption. 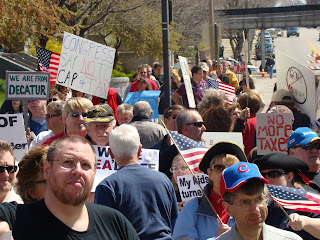 Today’s protest was one of several TEA parties held around the nation to demonstrate opposition to government spending and rising taxes under President Barack Obama’s administration. In Illinois, taxpayers face a potential 50 percent income tax increase (from 3 percent to 4.5 percent for individuals and 4.8 percent to 7.2 percent for corporations). The legislature also is considering hiking sales taxes on cigarettes, some flavored coffee drinks and motor fuel as a way to help generate more revenue and plug a budget deficit projected to reach as much as $12.4 billion. Rep. Lou Lang, deputy House majority leader from Skokie, said he understands why people are angry at the prospect of increased taxes nationally and locally. Quinn, at a news conference in Chicago, said he supports citizens taking to the streets to make their opinions known, but he’s still waiting to hear alternatives to an income tax increase. “We’ve heard a lot of chirping, but nobody has a specific concrete plan that gets the job done, without having to raise revenue in order to pay down the 11 and a half billion dollar deficit,” he said. Meanwhile, he launched a government Web site aimed at getting people to report fraud that involves taxpayer dollars. The site is supposed to make it easier for people to take advantage of a 1991 Illinois whistleblower protection law that encourages citizens to expose corruption and theft by offering a financial incentive. The law applies to all levels of government. According to Quinn, the law has already led to exposing Medicaid fraud and crooked highway contractors. Quinn said that citizens have an obligation to help police their government. “We as taxpayers have, I think, a duty to keep our eyes open. We want anyone who would even think of committing fraud against the taxpayers to think twice about it,” he said. Quinn also announced in his press conference today that some of the state historic sites could reopen as early as next week. Dave Blanchette, spokesman for the Illinois Historic Preservation Agency, said that notices to return to work have been sent to all 33 agency employees who were laid off late last year. He said that the agency has asked them to come back April 22 and that at least some historic sites should reopen by the end of next week. Blanchette said that all 11 sites that were closed by former Gov. Rod Blagojevich last year will be reopened, but the timing depends on how soon employees are available to come back to work. The governor and the agency will be making a formal announcement sometime next week. As the deadline for filing income taxes nears, Illinois groups urge protection of low-income workers if the General Assembly approves a state income tax increase for next year. The advocacy groups of Voices for Illinois Children, the Sargent Shriver National Center on Poverty Law, Protestants for the Common Good, the Center for Economic Progress and the Center for Tax and Budget Accountability joined in the state Capitol today to call for an increase in the state’s earned income tax credit. While an increase in the credit has been proposed many times in the Illinois General Assembly, advocates are looking for a sympathetic ear in the current administration. Jerry Stermer, Gov. Pat Quinn’s chief of staff, was founder and president of Voices for Illinois Children before moving on to his current position. The group want lawmakers to raise the amount of the state earned income tax credit so that the maximum per household would increase from $240 to about $1,000. The credit reduces the amount of income tax owed but can also result in a refund, according to the Internal Revenue Service. This year, a family of two parents and two children would have to earn less than $42,000 to qualify for the credit. According to Mary Ruth from the Center for Economic Progress, the average credit the state gives out is between $80 and $100. Sean Noble, spokesman for Voices for Illinois Children, said that the tax credit would target lower-income families more effectively than Quinn’s proposed increase in the personal tax exemption, which he wants to raise from $2,000 to $6,000. Noble added that an increase in the earned income tax credit might find more legislative support because it would cost less. He estimated that the earned income tax credit proposal would cost an additional $350 million a year. Quinn’s personal exemption increase would cost between $1 billion and $2 billion. The advocates could compromise, Nobel said, if Illinois were to increase the earned income tax credit and the personal exemption. Gaylord Gieseke, former vice president of Voices for Illinois Children, is serving as interim president until a replacement for Stermer is found. The organization is conducting a nationwide search. 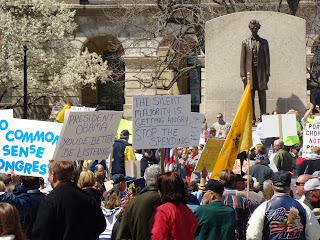 Check back tomorrow for coverage of the “Tax Day Tea Party,” a protest of government spending and tax increases. It’s scheduled to take place at the Capitol at noon. The last time he entered the building, he wore a running suit. This time, former Gov. Rod Blagojevich wore a suit and tie and maintained his innocence against the 16 criminal counts he was charged with in an April 2 indictment. U.S. District Judge James Zagel presided over the arraignment at the Dirksen U.S. Courthouse in downtown Chicago. Blagojevich pleaded not guilty to all counts and was represented by defense attorney Sheldon Sorosky. According to the Associated Press, Sorosky requested the prosecutor’s permission to use money from one of Blagojevich’s campaign funds, Friends of Blagojevich, to help pay for additional attorneys to represent Blagojevich. Sorosky reportedly stated his concern that it will take more than one attorney to give his client fair representation. But if Blagojevich were convicted, the Associated Press reported that prosecutors said they would ask the judge to forfeit the campaign money, which would mean that any attorney representing Blagojevich could be forced to return payments received from the campaign fund. Blagojevich lost his first legal team just prior to the Senate trial in which he was impeached and thrown out of office. Edward Genson, Sam Adam and Adam's son by the same name, cited different reasons for recusing themselves from the case. Robert Blagojevich, the former governor’s older brother, also appeared at the arraignment today and was represented by Michael Ettinger. Robert Blagojevich was hired by his brother to act as campaign manager after prosecutors began investigating Christopher Kelly, who initially headed the former governor’s campaign fund. In a statement released by the former governor’s public relations agency, Blagojevich said: “Now we can begin the process of getting the truth out, and I can clear my name and vindicate myself. I have not let down my family or the people of Illinois. I am innocent of every single allegation." During an appearance with President Barack Obama’s Education Secretary Arne Duncan in Chicago, Gov. Pat Quinn said the only way to clean up state government is by making major changes. Kelly, a former Blagojevich aide, and John Harris, Blagojevich’s former chief of staff, and Springfield businessman William Cellini are scheduled to be arraigned Thursday. Alonzo “Lon” Monk, Blagojevich’s former campaign manager and chief of staff, is scheduled to be in court next week. Harris and Monk are reportedly cooperating with investigators. Rubber will hit the road, federal stimulus funds will begin to flow and some state operations will get a boost through the rest of the fiscal year. Gov. Pat Quinn signed multiple bills into law that will authorize the spending of about $9 billion. Surrounded by Democratic and Republican leaders, Quinn also enacted pension reforms that are designed to restructure the five public employee pension systems in response to corruption allegations exposed during the federal probe of former Gov. Rod Blagojevich. The spending plan includes about $3 billion for a mini-capital plan, the first program to escape the halls of gridlock since before Blagojevich took office in 2003. Yet, the $3 billion plan is being framed as just a start to a larger program, which could include a $25 billion plan potentially financed by tax and fee increases. The funding proposals will face significant challenges in acquiring the number of votes needed to pass by the scheduled adjournment of May 31. All agreed that the capital bill and the pension revamp are only first steps to more construction plans and government reforms. Not all 11 state historic sites that were closed by Blagojevich last year will automatically reopen by June 30, according to Dave Blanchette, spokesman for the Illinois Historic Preservation Agency. He said the supplemental spending plan earmarks $800,000 to make payroll and hire seasonal workers to accommodate increased tourism at the 18 sites that are currently open. But he said the agency could not promise the money would stretch far enough to reopen all 11 sites. “We want to make sure we can make the money go as far as possible, but we also want to get the historic sites with the highest visibility reopened as soon as possible,” he said. High-visibility sites include the Dana-Thomas House in Springfield, the Lincoln Log Cabin near Charleston and the Hauberg Indian Museum at Black Hawk State Historic Site in Rock Island, he said. The decision about which sites will reopen will be made by the directors of the Historic Preservation Agency and the Department of Natural Resources, which Quinn recently ordered to consolidate by July 1. The House on Thursday night nearly unanimously approved the $9 billion plan for federal stimulus funds, transportation projects and supplemental spending for state operations. The Senate approved the package earlier in the day. The spending plans now head to Gov. Pat Quinn’s desk, satisfying the governor’s request for the General Assembly to approve a small version of a capital plan for roads and bridges before lawmakers left on a two-week spring break. House Republicans early in the day weren’t on board because it wasn’t clear how the money would be spent, said House Minority Leader Tom Cross. However, working with Quinn’s office throughout the day, he said his caucus finally got a list. “The governor was very helpful, both himself personally and his staff, in trying to make this happen,” he said. “Today’s actions are a great example of what we can accomplish when we come together with a common purpose,” Quinn said in a statement. Senate President John Cullerton, however, foreshadowed the difficulty in securing the three-fifths majority needed to do a larger capital program based on tax and fee increases later. A timely example of that difficulty in advancing any tax increase occurred early in the evening. After missing the mark by one vote the first time, a $1 sales tax increase on each pack of cigarettes advanced through the Senate Thursday when a second vote was taken. Senate Bill 44, which would phase the tax increase in over two years, had 29 in favor, 28 opposed and one voting present. It took a last-minute, closed-door meeting between Cullerton and House Speaker Michael Madigan before the vote was retaken, resulting in the 30 votes needed to pass. Twenty-six members still voted against it. The bill heads to the House, which will reconvene Friday morning. The Senate finished its business and headed home for spring break. Today’s 75-page federal indictment of former Gov. Rod Blagojevich and five members of his inner circle details an extensive and long-term scheme that allegedly began in 2002, before Blagojevich took his oath of office in January 2003. U.S. Attorney Patrick Fitzgerald’s office is now going after what’s described as the “Blagojevich Enterprise,” which includes the office of the governor and Blagojevich’s campaign fund, Friends of Blagojevich. The entity, the feds allege, primarily existed to “exercise and preserve power over Illinois government for the financial and political benefit of Blagojevich,” as well as his family members and friends. Read the U.S. attorney's press release here. A fact sheet is here. More context and online sources of how we got here at Illinois Issues magazine. Blagojevich and his associates allegedly conducted a pattern of dishonest behavior designed to enrich themselves, which would violate the federal Racketeer Influenced and Corrupt Organizations Act, or RICO, according to Andrew Leipold, a law professor with the University of Illinois’ Institute of Government and Public Affairs. Blagojevich is charged with 16 counts of federal corruption, including racketeering conspiracy, wire fraud, extortion conspiracy and attempted extortion. They each carry a maximum sentence of 20 years in prison and a $250,000 fine. He also allegedly lied to the FBI, a crime carrying a maximum five-year prison sentence and another $250,000 fine. In addition to the allegations already documented in the criminal affidavit filed with his arrest Dec. 9, 2008, today’s indictment includes new details and allegations. His brother, Rob Blagojevich of Nashville, Tenn., who chaired his campaign fund since August 2008. John Harris of Chicago, Blagojevich’s chief of staff from late 2005 until last December, when he was arrested with Blagojevich. Alonzo “Lon” Monk of Park Ridge, a lobbyist and longtime Blagojevich insider and campaign manager, as well as Blagojevich’s first chief of staff upon becoming governor in 2003. Christopher Kelly of Burr Ridge, a Blagojevich fundraiser and previous chair of Blagojevich’s campaign fund. William “Bill” Cellini of Springfield, director of the Illinois Asphalt Pavement Association, who raised money for Blagojevich and allegedly influenced officials of the Teachers’ Retirement System. He also was associated with Commonwealth Realty Advisors, a real estate management firm that invested hundreds of millions of dollars on behalf of TRS. He was indicted in October 2008 for “allegedly conspiring with others to obtain campaign funds for Blagojevich by shaking down an investment firm seeking a $220 million allocation from TRS.” This replaces that indictment. Before Blagojevich even became governor, he, along with Monk, Kelly and Tony Rezko, allegedly started scheming to use the governor’s office for financial gain that would be split among them once Blagojevich left office. Blagojevich allegedly let Kelly and Rezko exercise significant influence over state government operations, and they, in turn, allegedly generated millions of dollars for Blagojevich’s campaign fund and “provided financial benefits directly to Blagojevich and his family.” For instance, one part of the scheme allegedly included Rezko's real estate business paying Patti Blagojevich, the then-governor's wife, $12,000 a month, as well as another $40,000 in commission, "even though she had done little or no work," according to the indictment. The indictment also alleges that Blagojevich had control of his campaign fund at all times, even as the chairmen of the fund changed. Before Blagojevich became governor, he, along with Monk, Kelly and Rezko, allegedly started scheming to use the governor’s office for financial gain that would be split among them once Blagojevich left office. Blagojevich, Monk, Kelly and Rezko allegedly agreed to use Blagojevich’s and Monk’s offices to divide financial gain among themselves, including the kickback from the Pension Obligation Bond refinancing in 2003. The feds say Blagojevich lied to FBI agents on March16, 2005, when he said he kept state government and politics separate and didn't want to know who contributed money to his campaign. From 2004 to 2006, Rezko allegedly gave Monk between $70,000 and $90,000. Last year, Blagojevich allegedly directed Harris to find him a paid position at various state boards, and when that didn’t work, he directed Harris to connect his wife with financial institutions. When that failed, Blagojvich directed that those institutions to no longer get state business, according to the indictment. The indictment comes after more than a month of public hearings conducted by two panels, one appointed by Gov. Pat Quinn and one convened as a special joint legislative committee between the House and the Senate. Within two hours of the indictment being filed office tonight, one of the byproducts of the legislative committee passed both chambers. The General Assembly approved SB 364, crafted with the leadership of House Speaker Michael Madigan and Senate President John Cullerton. It’s aimed at reforming the state’s public employee pension system and requiring all trustees to abide by state ethics laws. All trustees of the Teachers’ Retirement System, specifically, would be replaced. And the governor would be able to appoint more trustees to that board. The Teachers’ Retirement System, which serves more than 355,500 teachers outside of Chicago, was one of the first state government operations revealed by the feds to be corrupted by Blagojevich’s inner circle, according to Fitzgerald’s office. System officials immediately released a statement of opposition, saying the governor’s ability to appoint more members has potential to increase, not decrease, the opportunity for political influence. The board’s statement said the rationale behind the measure “erroneously accused the elected members of the board of failing to prevent a corruption scheme in 2004 hatched by a former gubernatorial appointee,” meaning Stuart Levine. “The elected trustees of the TRS Board are angry and deeply troubled by the implication that they were somehow complicit in the illegal behavior carried out by Stuart Levine,” said Bob Lyons, a board trustee twice-elected by annuitants of the Teachers’ Retirement System following Levine’s resignation, according to the statement. Lyons also said that terminating Jon Bauman, executive director of the system, on July 1 would unfairly punish a man who hasn’t been accused of committing a crime. Cullerton said the reforms are designed to prevent “what Stuart Levine got away with for so long” by requiring consultants to register, requiring all board members to follow the same ethics standards applied to legislators and executive branch employees to prevent conflicts of interest and so-called pay-to-play politics. UPDATE: The Illinois Senate unanimously approved the $9 billion package to release federal stimulus funds, state bonds for road and transit repairs and supplemental spending for state operations. Senate Minority Leader Christine Radogno applauded the "true bipartisan cooperation" it took to get there. The package now heads to the House, which can either accept or reject it. It won't be able to change it. ORIGINAL POST: The Illinois Senate this morning advanced a spending plan worth slightly more than $9 billion that is designed to jump start the flow of state and federal dollars for construction plans, state operations and federal stimulus programs. Democrats and Republicans in a morning Senate committee applauded the plan as a “good first step” toward a bigger capital plan for road and school construction projects, but that’s tied to a string of potential and controversial funding sources, including tax and fee increases. Before hopping on board, Republicans sought a provision to ensure that the money would flow based on an existing five-year transportation plan, not based on political preferences. Senate Minority Leader Christine Radogno said during a morning committee that given the distrust between the legislative and executive branches during the last few years of former Gov. Rod Blagojevich’s administration, Republicans wanted assurances. This really kind of puts a public face on the private conversations that have been going on,” she said, adding that the plan was a “very good, positive step forward” for Illinois. For instance, $150 million would be doled out based on a traditional formula, where Chicago-area districts get 45 percent of the funding and downstate districts get 55 percent of that funding. Another sum of $450 million would be distributed based on an existing five-year plan for construction projects, which Illinois Department of Transportation engineers rank by another formula. Labor groups represented by the AFL-CIO and some operating engineers support the plan; however, one Springfield-based chapter of the operating engineers union opposes it because the state-funded capital plan would only designate $8 million to the central Illinois district that includes Sangamon County. But Cullerton pointed out that the central Illinois district would get $54 million of federal stimulus funds. Federal stimulus funds will distribute money for everything from weatherization to education. However, the plan advanced by the Senate today would take some money out of the portion that would have gone to public education and use it for state operating expenses. Then the state would use incoming federal stimulus funds to eventually backfill the amount for education. According to Sen. Donne Trotter, chief budget negotiator for the Senate Democrats, education, in the end, would come out about even. That is, after all, the intent of the federal stimulus, he said. The full package now heads to the full Senate, where a vote is expected this afternoon. If approved, it would head to the House later today or tomorrow. $1.7 billion to pay down the state’s Medicaid bills, including an enhanced federal reimbursement rate of about 61 percent for 27 months. $500 million for high-speed rail. $300 million for a Chicago-area project to reduce freight and vehicular traffic congestion. Other funds are earmarked for low-income housing, developmental disability and mental health services, programs for women and children, youth services, criminal justice and domestic violence grants, weatherization jobs and training, environmental protection, water treatment and education. 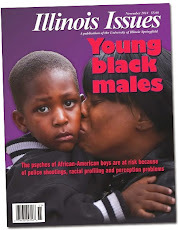 Read more in Illinois Issues this month. $2 billion bonded from the dedicated Road Fund to repair roads and bridges. $1 billion bonded from the state’s general fund for transit maintenance projects. $150 million for emergency pothole repair on state and local roads. $40 million for Chicago-area transportation agencies to release funds that previously were suspended under a previous capital program. $363 million to reopen closed historic sites through June 30. $25 million for services for women and children, capturing more federal matching funds. $20 million for flood relief. $10 million for line-of-duty awards. $6.7 million for court reporters. Republican lawmakers still believe there’s more than one way to skin a deficit, and it’s not by raising taxes. According to the report, the most significant Medicaid cut could come from applying for a federal waiver for Medicaid-eligible programs to capture as much as $435 million more in federal matching funds. Another suggestion is the creation of a private-public partnership, which would transfer decisions regarding benefit eligibility to private partners. That, in turn, would help to decrease the opportunity for fraudulent claims. And, while all of the savings weren’t specified, the report suggests that a new way to manage pharmaceutical benefits and higher co-pays could save $110 million in one year and $730 million over five years. Murphy said the Republican committee members found areas in the state’s finances that could be reduced or eliminated, saving a total of more than $3 billion annually and more than $20 billion throughout the next five years. “This is a meaningful deficit reduction without raising taxes, and it’s a serious answer to those who are asking for alternatives to the governor’s record-setting tax hike,” Murphy added. Last week ended the series of four bipartisan Deficit Reduction Committee meetings in which members heard from various budget experts about ways to fix the state’s deficit. Despite hours of testimony, members were no closer to solving the state’s financial crisis than when they started. Without assigning a dollar amount to the savings, the report also listed trimming pension benefits for new state employees, requiring more managed care health benefits for existing and new employees and allowing more charter schools to open as additional cost-cutting measures. State lawmakers are expected to vote tomorrow on a “mini-capital plan,” which would drive $2 billion into crumbling roads and bridges and $1 billion into mass transit as part of a five-year transportation program, relying on bonding and transfers from existing state funds. The plan is being framed as a precursor to a more robust capital plan that would rely on new revenues through driving-related fees and, potentially, tax increases. But some fear enacting a mini-capital plan now could slow the momentum for a larger plan later. Illinois Department of Transportation Secretary Gary Hannig, former deputy leader for House Speaker Michael Madigan, said this afternoon in the Statehouse that the mini-capital plan would go toward maintaining and fixing existing roads and bridges, not paving new ones. Spending money on existing roads, however, would not tap into federal highway funds that have been waiting a long time for a state match. Hannig added that the proposal would include an emergency plan to fill potholes on some state and local roads. While Sen. Martin Sandoval, a Chicago Democrat who chairs the Transportation Committee in his chamber, said he would vote to support the mini-capital plan, he said it would be a minimal investment that drastically undercuts the funding needed for mass transit. There’s been a longstanding agreement that for every $1 spent on mass transit, the state would spend $2 on roads and bridges. Sandoval wants to change that so the state would spend an equal amount on each. He cited a five-year plan to dedicate about $5.5 billion for roads and bridges and another $5.5 billion for transit. To generate some more money that could shore up funds for mass transit, he supports the idea to increase the state’s motor fuel tax by at least 8 cents a gallon. That’s currently proposed in HB 1. Yet, Sandoval said that a motor fuel tax increase, alone, wouldn’t be enough. It would have to be coupled with Quinn’s proposed increases in driving-related fees, as well as federal funds. Transportation Department spokeswoman Marisa Kollias said the agency decided to put all federal “highway investment” funds into highways rather than into transit. “There are needs in both programs, and we chose to use the limited funds to address road and bridges,” she said in an e-mail. Sandoval’s push for more mass transit money will come up again the week the legislature returns from its two-week spring break. He said he plans to schedule a public hearing in Springfield to discuss a $13.5 billion capital plan called for by labor and business officials of the Transportation for Illinois Coalition. That $13.5 billion, however, also doesn’t include a specific funding source. The coalition offers general ideas here. The coalition did send letters today to the governor and to lawmakers to say its members supported the mini-capital plan.